ISTANBUL (AP) — Turkey said Sunday it would take steps to create “safe zones” across northern Syria, including in areas held by Syrian Kurdish fighters who are allied with the United States but who Ankara views as terrorists. 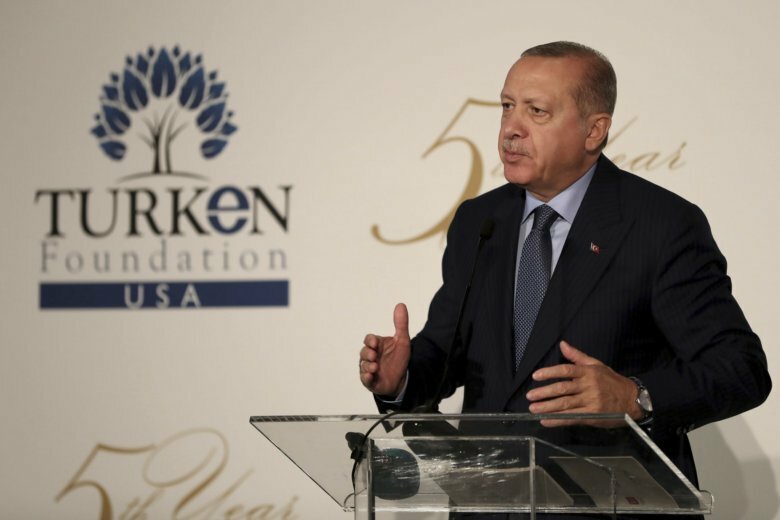 President Recep Tayyip Erdogan, speaking in New York ahead of the U.N. General Assembly, vowed to clear the region of the Kurdish fighters, who Turkey says are linked to the long-running insurgency in its restive southeast. “God willing, in the upcoming period, we will increase safe zones within Syria, also encompassing eastern Euphrates,” he said. Erdogan vowed that northern Syria would not be a “terror corridor,” citing Turkish incursions in 2016 and 2018 to the west of the Euphrates River. Those were aimed at pushing Islamic State militants as well as the Kurdish fighters away from the border. Turkish troops fought alongside Syrian opposition forces, and later set up local governance in the areas they retook. Erdogan says Turkish and allied forces have brought stability to the area, allowing children to return to schools. Turkey has periodically threatened to expand its military operations into Kurdish-held areas further east, where U.S. troops patrol alongside the Kurdish fighters. The Kurds played a key role in driving the IS out of large parts of northern and eastern Syria with the help of U.S.-led airstrikes. Erdogan recently reached an agreement with Russian President Vladimir Putin to pause a Syrian government offensive on the northern province of Idlib, the last major stronghold of the Syrian opposition. The details on the implementation of the agreement remain vague. Erdogan is not expected to meet with President Donald Trump on the sidelines of the U.N. meeting, as relations remain strained over a number of issues.